Ice in Thunder Bay & Coming to You Soon! Thanks to iceboat.org for the picture and the good news. This bodes well for the upcoming Great Western Challenge, the season opener for the rest of us. To be held on the best ice in Minnesota, first weekend in December, which this year is December 1-3, Friday to Sunday. There will be a ton of DNs there, maybe other classes as well. IF you are planning on going or want to go and need a ride, please email me at t_thieler@yahoo.com Let me know what kind of car you have, how many empty seats you have, where you are leaving from and when, and whether or not you have a trailer. Hopefully we can match cars and drivers with copilots and navigators. Whatever it takes to show up with a big eastern contingent! 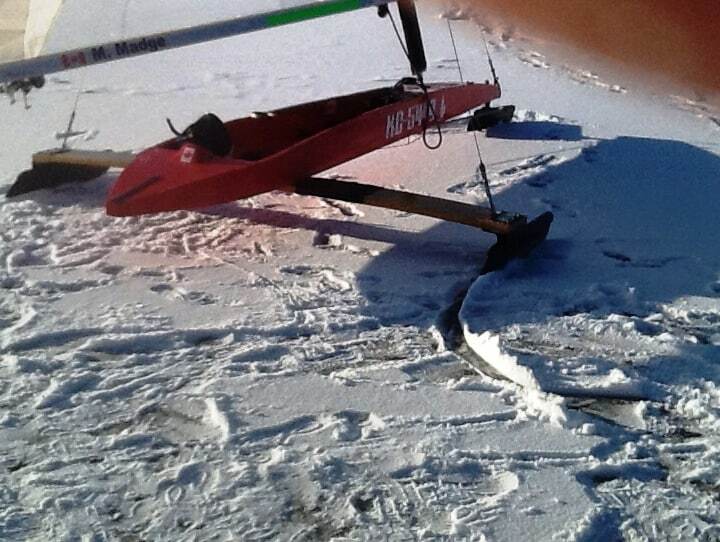 The site to watch for official info on this one is http://iceboating.net/ although http://www.iceboat.org will have info and this site should as well. And the weekend after that the Tune Up Clinic will be held at Steve Lamb’s shop. Rick Bishop is putting together a good itinerary for this event and no matter what class of boat you sail you will learn something that will make you better and faster! December 9 is the day, tune in to this site for details. Cold snap is on the way, time to THINK ICE!! This entry was posted on 11/10/2017 by Commodore James "T" Thieler DN US 5224. It was filed under 2017 Season .